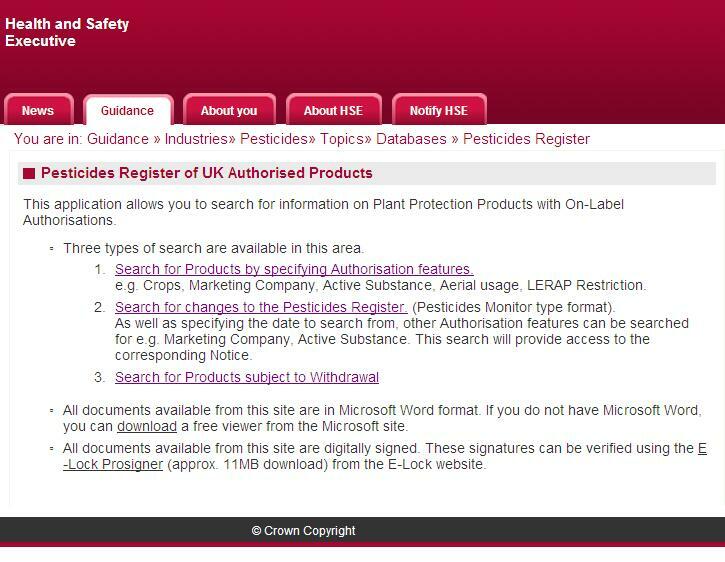 See the Pesticides Register Database. 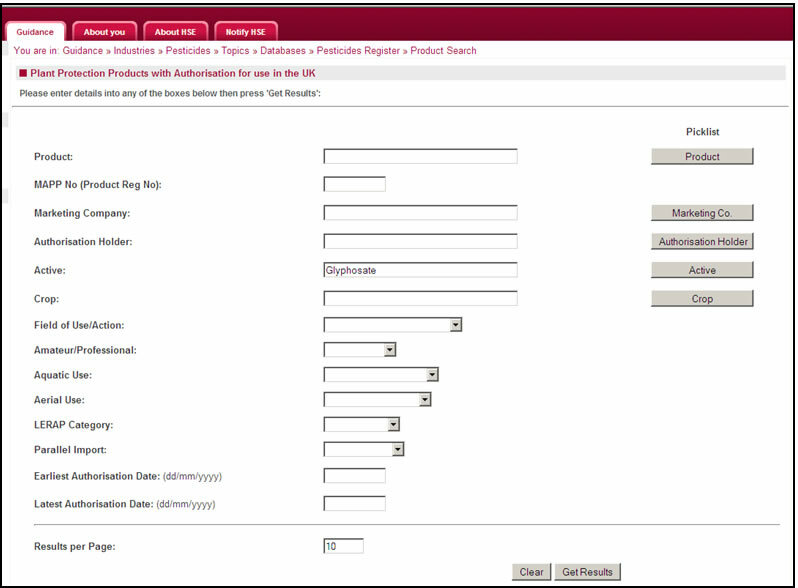 When you enter the database, a screen presenting 3 search options will be displayed. None of the searches are case sensitive, so both upper and lower case letters can be used. Search for Products by Specifying Authorisation Features. Search by Product name, MAPP or MAFF number, Marketing Company, Authorisation Holder, Active Substance, Crop, Field of Use, Amateur/Professional, Aquatic Use, Aerial Use, LERAP Category, Parallel Import, Earliest or Latest Authorisation Date. Search for Changes to the Pesticide Register. Search for changes made since a specified date. Search for Products that are Subject to Withdrawal. Search by date or Marketing Company or both for products that are going to be withdrawn from the market. 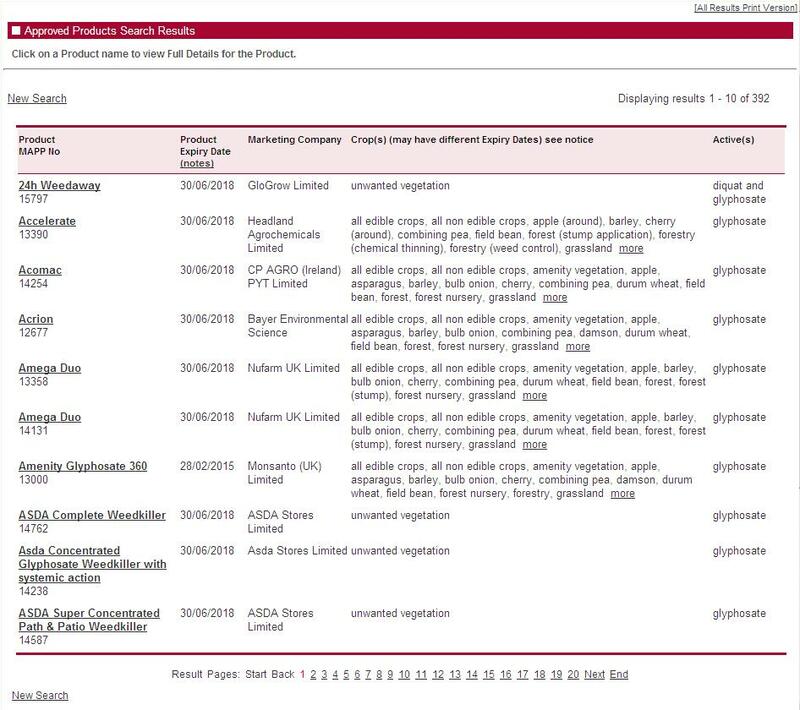 This search provides details of current Authorisations. Selecting this link will display the Product search page shown below. Please Note: Searches will only find products that are authorised at the time of the search. The search facility is not case sensitive, so either upper or lower case can be used. 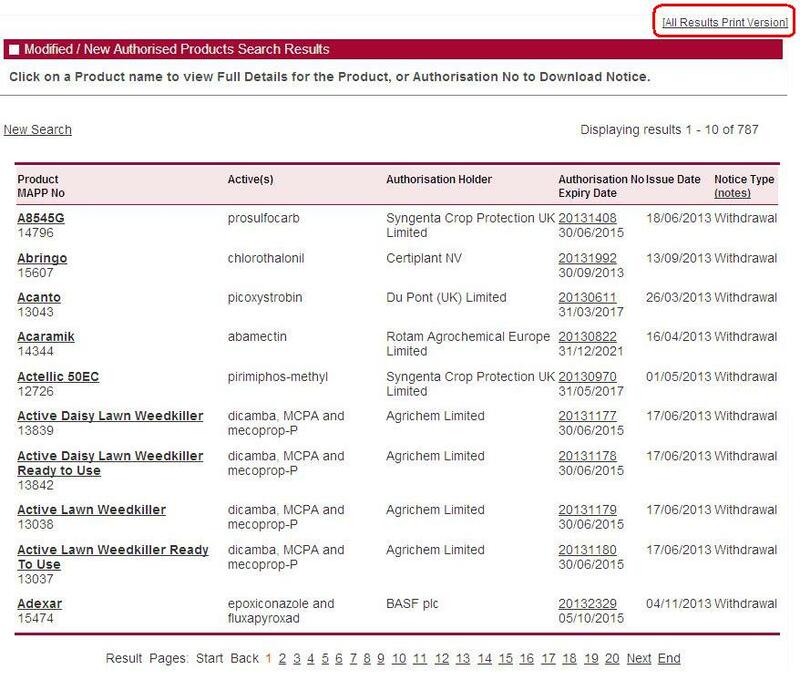 Lists of available Products, Marketing Companies, Authorisation Holders, Actives and Crops can be obtained by clicking on the appropriate button to the right of the entry field, or you can make a selection from the drop-down lists for the other search criteria. When searching for company names, you can retrieve all variations by entering the common part of the name. For example, where companies have different branches such as Bloggs Ltd and Bloggs UK, entering just the common part of the company name would return products for both branches. To do a search based on the Product Reg No., you will need to enter the relevant number which can be found on a product label and consists of the letters "MAPP" or "MAFF" followed by a 5 digit number. Enter the 5 digit number, including any leading zeroes, into the box. To search for all extant products enter the date 01/01/1960 in the “Earliest Approval Date” field. However, due to the very large number of Authorisations, you should be aware that this search will take some time to process. Once you have specified your search criteria, click on the “Get Results” button at the bottom of the screen. This will carry out the search and return the first 10 results, with the option to view more on a page by page basis. To move between pages in the results, click on the page number at the bottom of the results table. From the results screen, you can print a list of all the products returned by your search. This is accessible from the “[All Results Print Version]” link above the results table. Clicking on this link, will produce a print version of the results, listing all retrieved products. For large data sets, this can take some time to produce. If there are any replacement products these will be listed at the bottom of the details page (not shown). Also, any digitally signed authorisation notices available in the e‑@pproval section of the website, will be listed at the bottom of the details page with a link to the document. Selecting this link will take you to the following search page. This option allows you to search for changes made since a specified date. This has similar search options to the main search page, with the addition of the date from which changes are required (which must be filled in), and the option to specify the type of Notice that you want to retrieve. 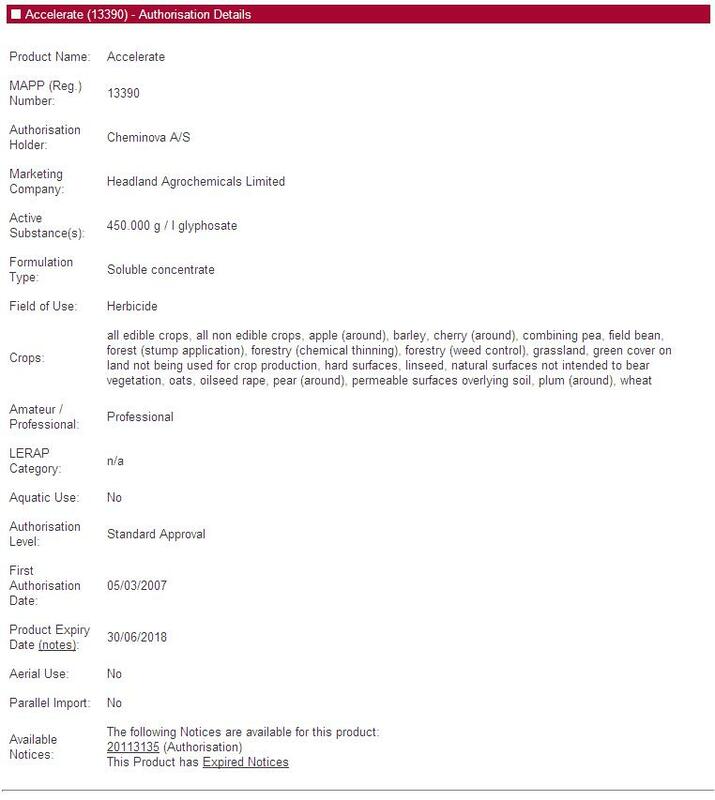 The date used here is the date the information is added to the on-line Pesticides Register, rather than the date of the Authorisation. If you need to search on the Authorisation date, then you can do this from the main search page. The search is not case sensitive, so upper or lower case can be used. As with the main search, you can click on buttons to the right of the fields to access help lists or drop down boxes to aid selection. Once you have entered your search criteria, click on the “Get Results” button. This will perform your search and return the first 10 results. As with the main search screen, click on the page number at the bottom of the results table to move between pages in the results. From the results page you can also see the full details of a Product by clicking on the Product Name, which is underlined. The electronically signed notice can also be accessed by clicking on the Approval number. You can print a list of all the Authorisations returned by your search by clicking on the “[All Results Print Version]” link above the results table. This search allows you to find products that are going to be removed from the marketplace. 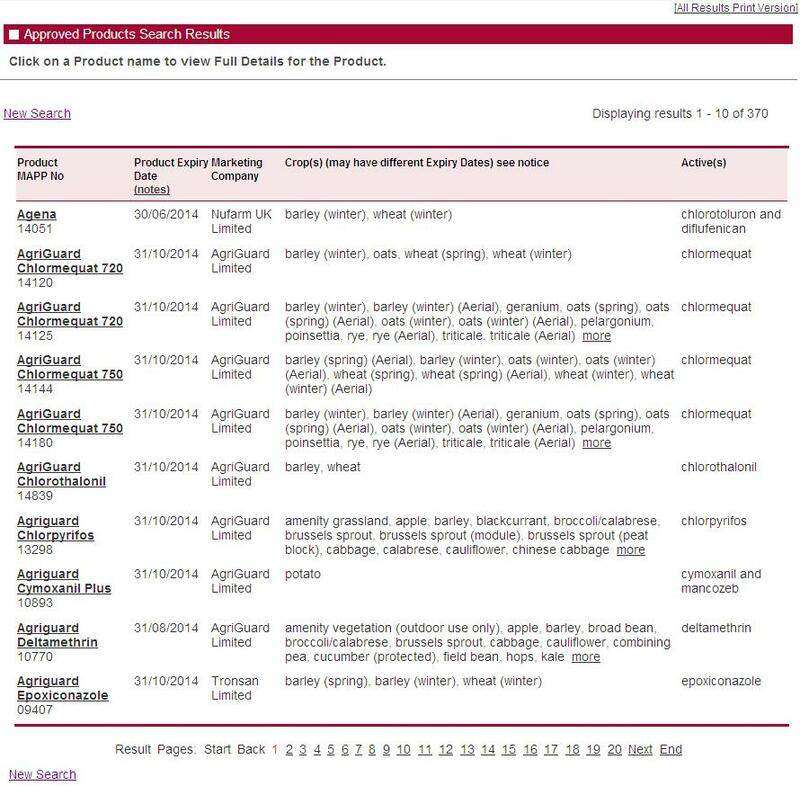 Selecting “After” from the drop down menu and entering the date into the first box will generate a list of all products that are due to be withdrawn after the date selected. To find products with a specific marketing company which are due to be withdrawn, use the picklist to the right of the middle box (circled above in blue) to get a list of all the marketing companies which you can select from. It can be useful to change the number of results from the default 10 to 100 as this will cut down on the number of pages you will need to look through. All results are listed alphabetically. Selecting search terms from a picklist will ensure that the system will recognise the search terms. 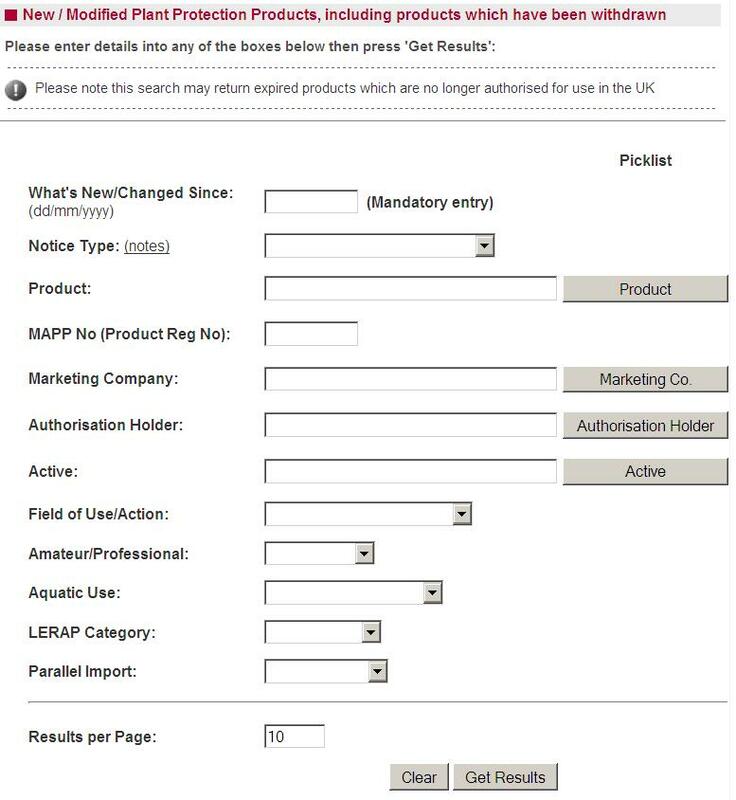 Use the 'picklist' buttons on the right hand side of the search form: Product, Marketing Company, Authorisation Holder, Active or Crop. The Drop-Down lists in some of the boxes provide further choices to refine the search. Clicking on the 'Get Results' button produces a set of results which are then displayed on one or more pages. You can move through the results pages by clicking on the page numbers at the foot of the each page. If only part of the company name is known you can use a % to carry out a 'wildcard' search. 'Bloggo%' will find results relating to 'Bloggo Ltd', 'Bloggo UK', 'Bloggo International' etc.